You need a complete smile with a full set of teeth for a lot of reasons. A complete smile makes you look better and feel better about yourself. A whole smile also helps you chew your food better, which improves your digestion and general health. Dr. Jose Arauz in Jacksonville, NC wants to share the best way to make your smile whole again, dental implants! Dental implants are completely stable and won’t move around like partials or dentures. That’s because they are firmly secured and surrounded by bone just like your natural teeth. Dental implants look cosmetically beautiful because the implant crown is made of high-grade dental ceramic that is light-reflective, just like your natural teeth. Dental implants are easily maintainable with regular brushing and flossing. There is no need to remove and soak them like partials or dentures, and no need for cumbersome flossing tools that you need with bridges. Dental implants help to conserve bone which can help you look younger. That’s because they don’t put pressure on your jaw like partials and dentures, which can cause your bone to diminish over time. Implants help restore your youthful facial contours and strong jawline. Dental implants give you a sparkling smile for life because they resist stains even if you smoke or drink coffee. Dental implants are also the most successful surgical implant with success rates over 95 percent, according to the American Academy of Oral and Maxillofacial Surgeons. Dental implants are placed during a simple in-office procedure and then after a healing period, the implant crown is placed on top of the implant. You now have a new tooth, as good or better as your natural teeth! For more information about dental implants, call Dr. Arauz in Jacksonville, NC. Let dental implants make your smile whole again by calling today! As with the rest of the body, tooth pain is an indication that something’s wrong. While the exact cause requires a dental exam, the location, quality and duration of the pain could narrow the possibilities. With that in mind, here are 3 types of tooth pain and what it might be telling you. Sensitivity. 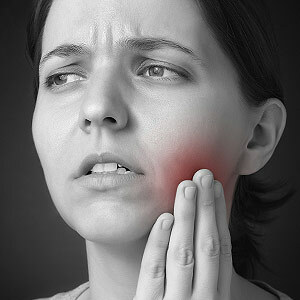 Pain or discomfort when you eat or drink cold foods or bite down could mean you have a small area of decay in the tooth, a loose filling or an exposed root surface from gum recession. Dental work to repair a decayed tooth or filling could alleviate the pain; in the case of gum recession, you may need to reduce overaggressive brushing or seek treatment for periodontal (gum) disease, the two main causes of the condition. Dull or lingering pain. A dull ache in the rear sinus area could indicate a problem with a back tooth — they share the same nerve pathways as the sinuses, so you may be feeling referred pain. In the case of lingering pain after eating or drinking something hot or cold, there may be decay within the inner pulp chamber of the tooth that’s damaging or even killing the nerve tissue. If so, a root canal treatment might be in order. Sharp pain. That sudden, excruciating pain when you bite down could mean you’re experiencing advanced decay, a loose filling or possibly a cracked tooth. If the pain seems to radiate from the gums — and they’re swollen and sensitive — you may have developed an abscess brought on by periodontal (gum) disease. In all these cases, appropriate dental treatment like decay removal and filling, root canal treatment or plaque removal may be necessary, depending on the cause and extent of the problem. Regardless of what kind of pain you’re feeling, you should see us as soon as possible — in many situations waiting will only make the problem worse. The sooner we discover the cause, the sooner we can begin the right treatment to solve the issue and alleviate your pain. You may not always be able to tell if your child's bite isn't developing properly. Â That's why you should have them undergo an orthodontic evaluation around age 6 to uncover any emerging problems with tooth misalignment. Still, there are some visible signs all's not well with their bite. 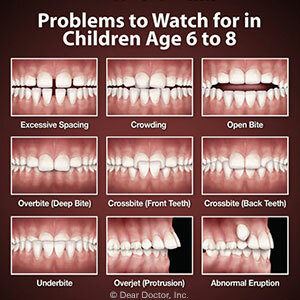 As the primary (baby) teeth give way, the permanent teeth erupt sequentially around ages 6 to 8. As they come in, you should notice that each tooth fits uniformly next to each other without excessive gaps or, on the other end of the spectrum, not crowded together in crooked fashion. Upper teeth should also fit slightly over the lower teeth when the jaws are shut. If their teeth appearance deviates from these norms, they may have a bite problem. Here are 4 abnormalities you should watch for. Underbite or deep bite. As we mentioned, the front teeth should cover the lower teeth with the jaws shut. In an underbite, the reverse happens — the lower teeth are in front of the upper teeth. It's also a problem if the upper teeth cover the lower teeth too much (often referred to as “deeply”). Open bite. This occurs when there's a gap between the upper and lower front teeth while the jaws are shut together. One possible cause is late thumb sucking, which can put undue pressure on the front teeth and cause them to develop too far forward while forcing the bottom front teeth further backwards. Crossbites. This kind of bite occurs when some of the teeth don't fit properly over their counterparts, while others do. Crossbites can occur anywhere in the mouth, for example the upper front teeth fitting behind the lower front teeth while the back teeth overlap normally, or the reverse (front normal, back abnormal). Misalignments and Abnormal Eruptions. Sometimes upper teeth may align too far forward, a situation known as protrusion. Conversely, lower teeth (or the jaw itself) may come in too far back (retrusion). Because a primary tooth might be out of position or not lost in the proper sequence, a permanent tooth might noticeably erupt out of its proper position. If you notice any of these situations with your child's teeth see your dentist or orthodontist soon for a full examination. If caught early, we may be able to take action that will lessen or even eliminate the problem. If you would like more information on treating bite problems, please contact us or schedule an appointment for a consultation. 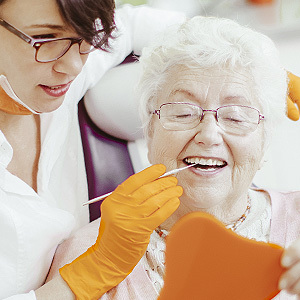 While some aspects of regular dental visits are much the same for everyone, they can be more involved for an older adult. That’s because people later in life face an increased risk of dental disease and other age-related issues. If you’re a caregiver for an older adult, you’ll want to be aware of these heightened risks. Here are 4 areas of concern we may check during their next regular dental visit. Oral cancer. While it can occur at any age, cancer is more prevalent among older adults. Although rarer than other cancers, oral cancer’s survival rate is a dismal 50% after five years. This is because the disease is difficult to detect early or is misidentified as other conditions. To increase the odds of early detection (and better survival chances) we may perform a cancer screening during the visit. Dental disease. The risks for tooth decay and periodontal (gum) disease also increase with age. A primary risk factor for older people is a lack of adequate saliva (the mouth’s natural disease fighter) often caused by medications or systemic conditions. We’ll watch carefully for any signs of disease, as well as assess their individual risk factors (including medications) for decreased oral health. Dentures. If they wear dentures, we’ll check the appliance’s fit. While dentures can wear with use, the fit may also grow loose due to continuing bone loss in the jaw, a downside of denture wearing. We’ll make sure they still fit comfortably and aren’t stressing the gums or supporting teeth. It may be necessary to reline them or consider replacing them with a new set. Oral hygiene. Brushing and flossing are just as important for older adults as for younger people for preventing dental disease, but often more difficult due to mental or physical impairment. We can note areas of bacterial plaque buildup and recommend ways to improve their hygiene efforts. Depending on how well your older adult can care for themselves, it may be advisable for you to come with them when they visit us. Our dental team can provide valuable information and advice to help you help them have a healthier mouth. Can Cosmetic Gum Surgery Benefit My Smile? Would Dental Implants Help Me? What's the Cost of Skipping a Check-up? Welcome to our Patient Newsletter! To Floss or Not to Floss...is that a real question?